Handle - stabilised curly birch set on green fibre liners with a green detailed “hallmark” mosaic pin and lanyard hole. In hand dyed and sewn full grain leather sheath which hangs around the neck. Marines Hunter in it's hand dyed and hand stitched sheath made from full grain, vegetable tanned, 8oz tooling shoulder - the best cow leather available. 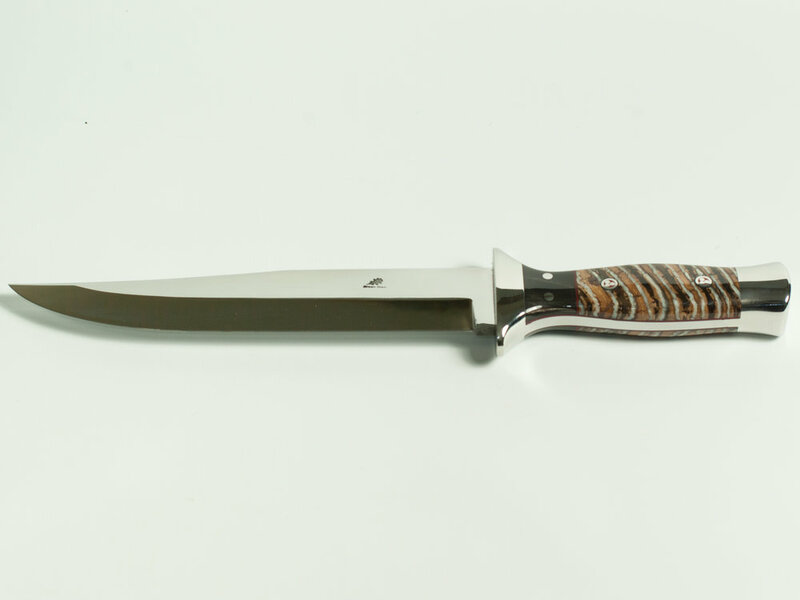 Comprising of a carving knife and fork in Damasteel® damascus steel with sterling silver mounted red deer antler. Presented in a solid maple fitted case with walnut trim. A traditional Japanese vegetable knife hand forged from san mai steel, (three layered). The handle is made from Australian box and red gidgee as specified by my customer. This is one of my Warrener design small knives but my customer requested I make one for her with a red stag antler handle. 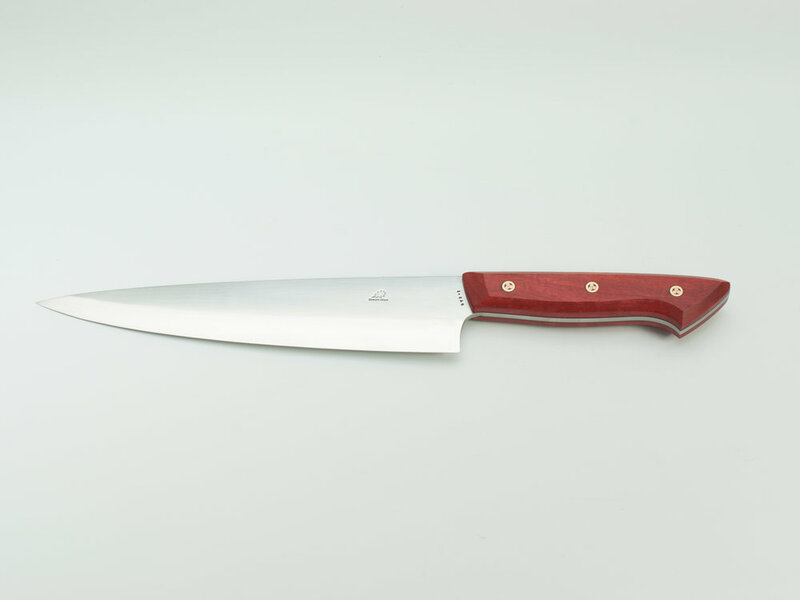 Full tang santoku in RWL-34 stainless knife steel. Fully stabilized yew handle fixed with my unique 'hallmark' mosaic pins. 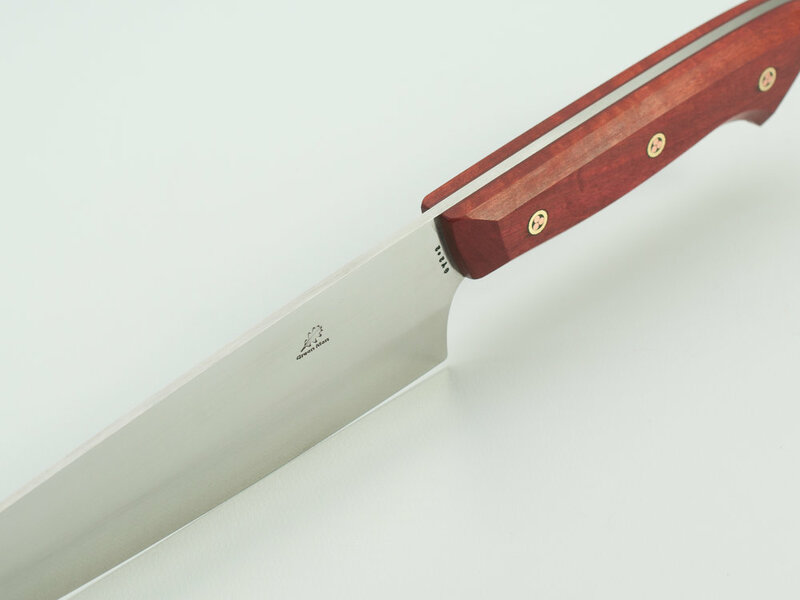 This is Seiyo Santoku SN1.16 shown in it's saya (wooden sheath). 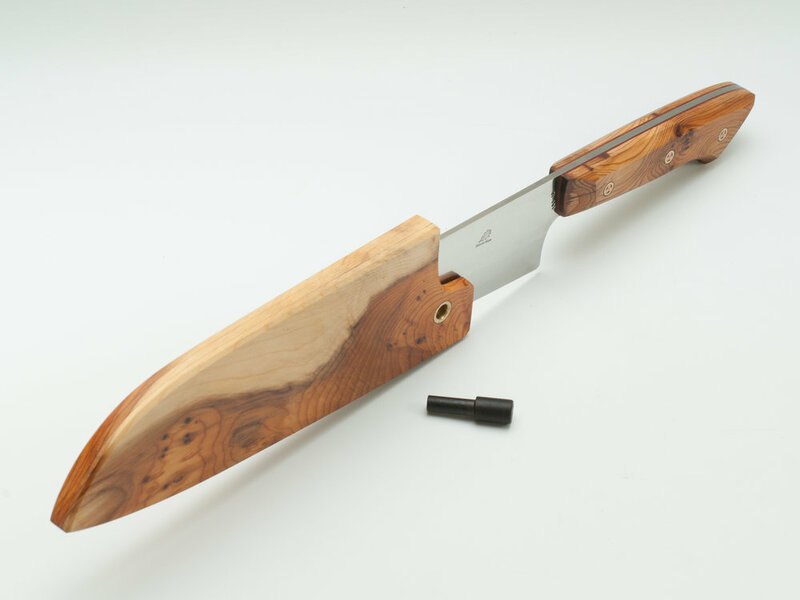 It is made in beech and has a peg that prevents the knife from coming out which I turned from the same wood as used for the handle. This knife is my standard Woodsman 1 design but my customer wanted a bolster to the handle and green liners and trim. 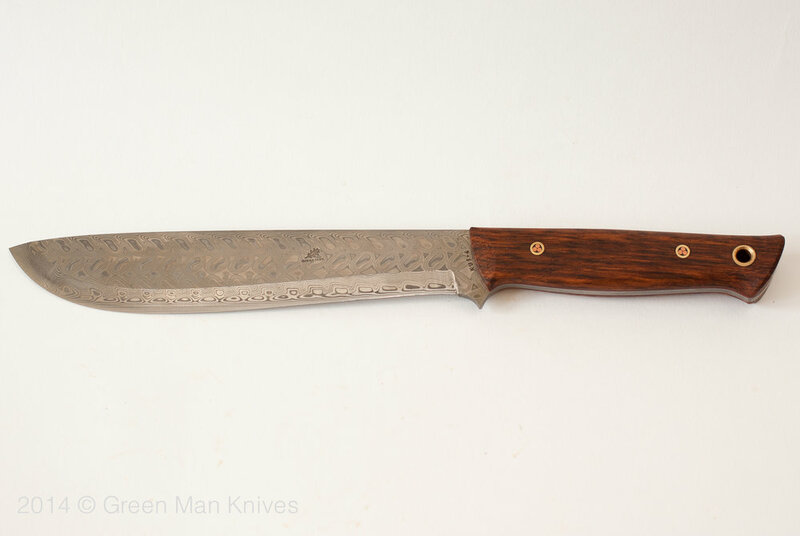 4mm Damasteel® damascus steel, full tang blade; desert ironwood handle scales fixed with my 'hallmark' mosaic pins. 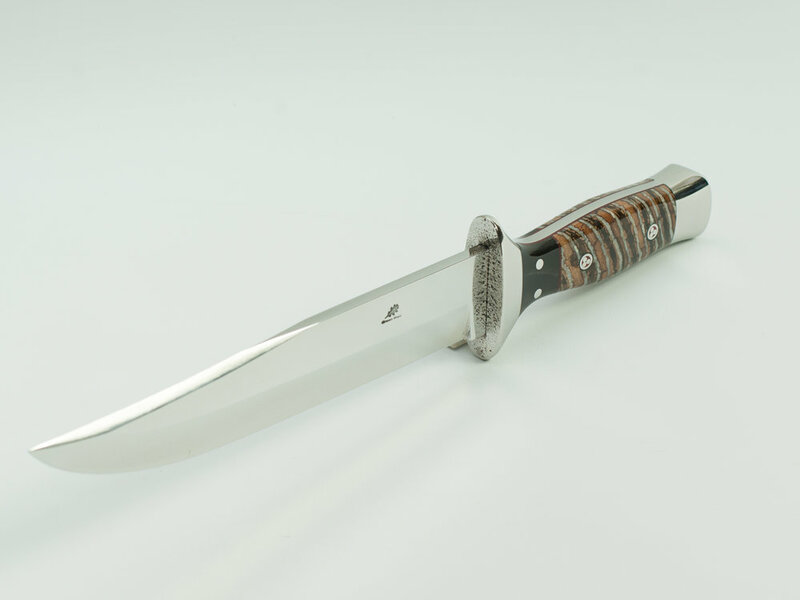 The knife showing its matching knife steel and leather sheath. I hand forged this marlin spike from stainless steel then hardened it. A shackle key is cut into the top and it is part polished. Marlin spikes are used by sailors or anyone involved in rope work when a stubbornly tight knot needs to be undone. 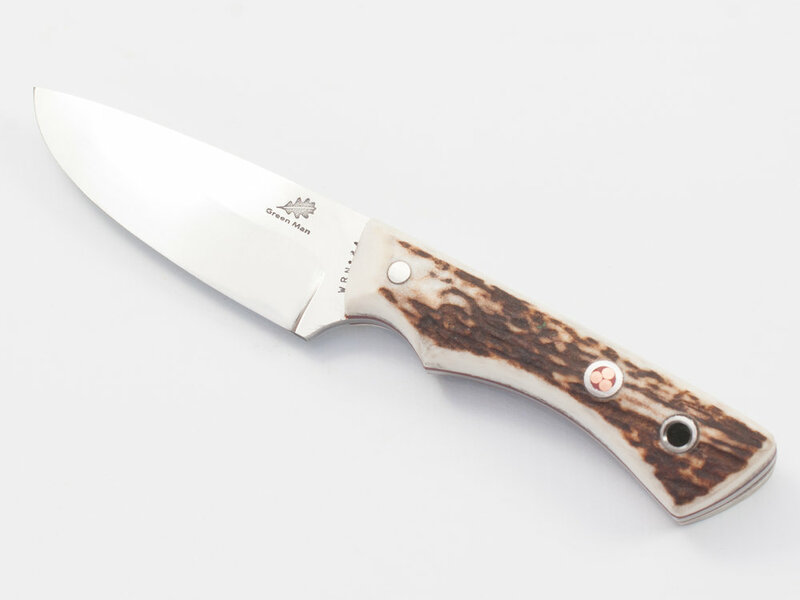 The full tang handle is made from buffalo horn and 30,000 year old mammoth tooth with stainless steel finger guard and pommel. 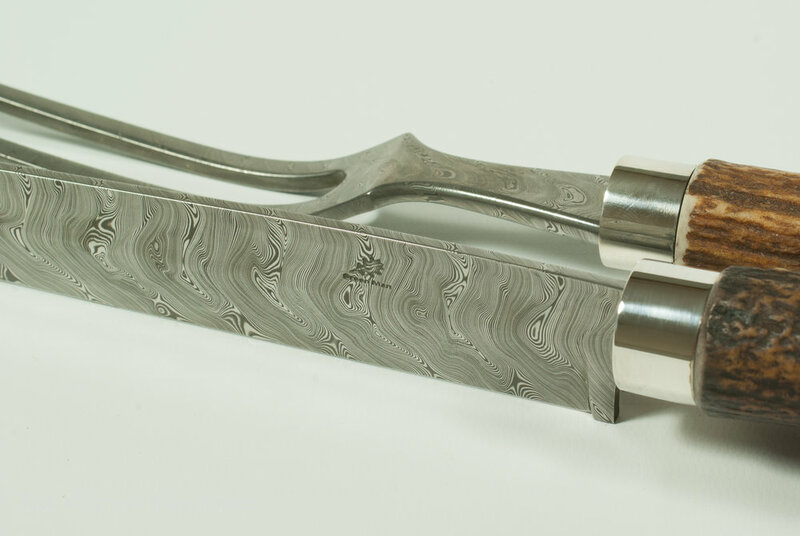 Detail of carving set showing Damasteel® damascus steel pattern and sterling silver ferrules. Camp knife in full grain tooling leather sheath, hand dyed and stitched with scandi belt loop. 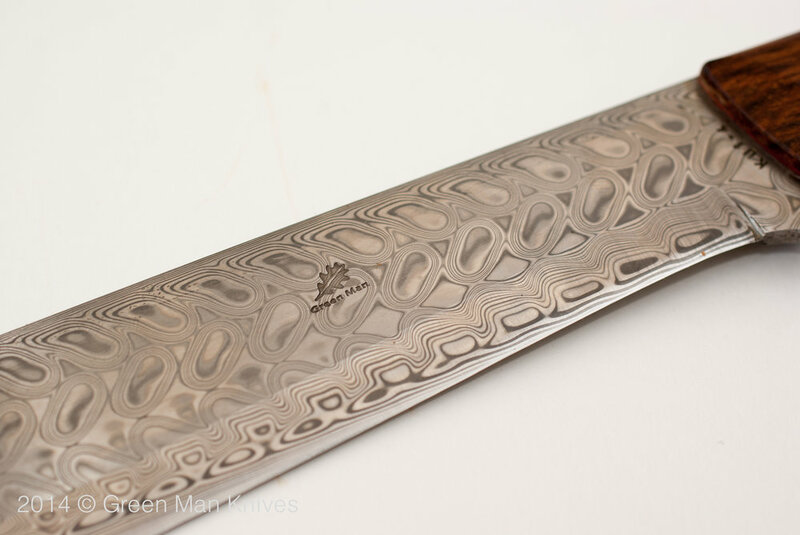 Detail of Damasteel® damascus steel camp knife showing patterning and Green Man Knives logo stamped into blade. 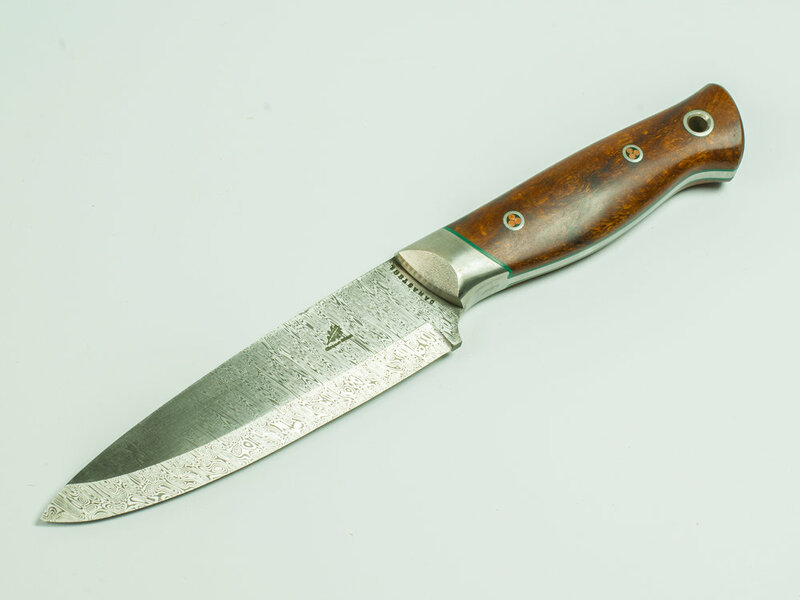 I am Tim Chilcott and I am a designer and bladesmith. 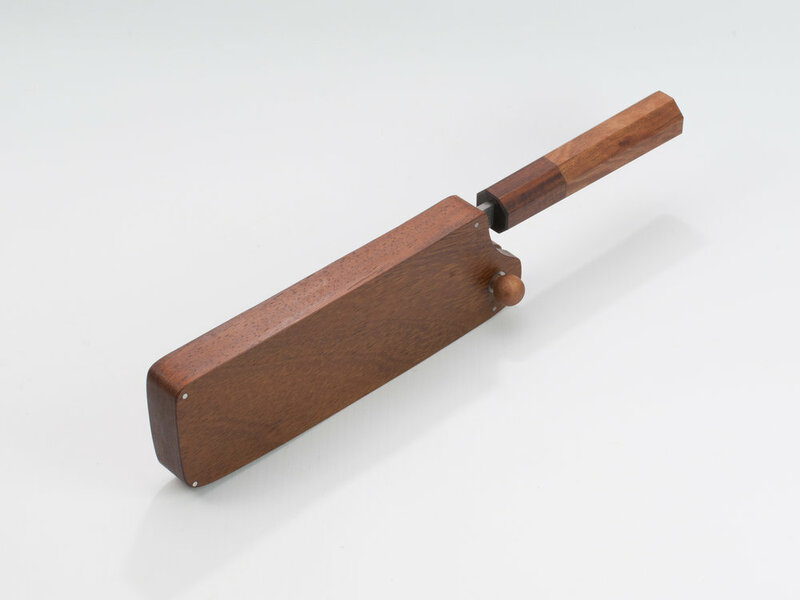 I have spent 40 years as a craftsman, formerly as a silversmith and latterly making knives. I am proud of my meticulous eye for detail and range of skills that my time as a silversmith brought me but believe I have found my true vocation - making excellent tools for talented craftspeople and outdoorsmen and women. When you look through the various pages you will discover the items I have for sale in stock; items you will be able to order as bespoke versions and a Gallery of special commissions that I have undertaken.